Holiday meals are as much about tradition as they are about gathering (perhaps the familiarity of tradition is what really engenders the sense of comfort in the holiday season), and the invocation of tradition often results in enshrining bad cooking. Case in point - sweet potatoes. I've had the sorry mushy orange affair coated with sticky marshmallows before, and have met far more detractors of the casserole than people who look forward to it -- and the latter sound mostly pleased with the excuse to eat something decidedly dessert as a "vegetable" and thus, "healthy". What a way to murder a perfectly okay ingredient. Moreover, so many think of this as the only way of preparing sweet potatoes, and thus, come to the conclusion that they don't like sweet potatoes. And dread having to prepare them for the holidays. Of course, one difficulty with that conclusion is that the orange fleshed mushy thing is by far the least interesting of such tubers. 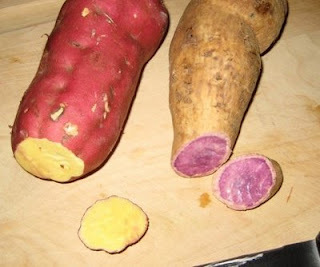 Pictured is a yellow fleshed Japanese sweet potato, and the purple Okinawa sweet potato. Both are vastly superior to the orange sweet potato in flavor and texture. Simply roasting these in their skins, and serving hot with a little butter and salt is an eye opening experience for people who have been traumatized into disliking sweet potatoes. I have prepared a gratin with the Japanese yellow fleshed variety - simply slice thinly, and toss with red chile flakes, salt, olive oil, garlic, and heavy cream, then layer in a baking dish, and bake until cooked through. Many requests come from that. I am plans of making some kind of soup from the purple. But it is so delicious just baked, I don't know if I'll have the materials ready :).